In 2002, Infogrames and Ratbag Games released World of Outlaws: Sprint Cars 2002. It was a limited run game that was widely requested and it had a huge cult-like following. I was working videogame retail during the time the game came out and nearly every week I would get people asking about it. For whatever reason, a sequel was never made and the franchise just disappeared. THQ has decided to change all that and are bringing the world of sprint cars to consoles once again. Developed by Big Ant Studios, World of Outlaws: Sprint Cars will be making its way to the Xbox 360 this February. 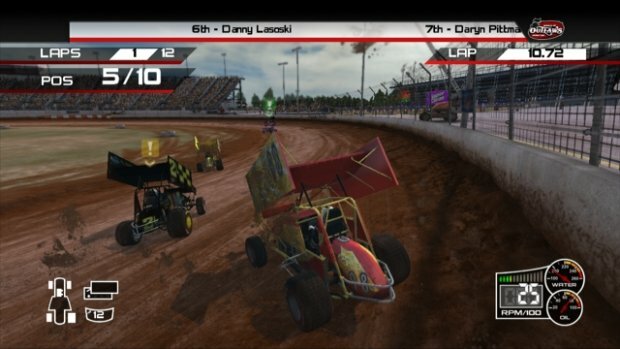 Real sprint car racers such as Donny Schatz, Jason Meyers and more will be featured as you race around on various famous dirt tracks from around the U.S. World of Outlaws will also feature five multiplayer modes for up to eight-player races. This is a very niche sport, especially in the world of videogames. Any of you interested at all in the return of sprint cars to gaming?